Canon's series of image stabilized binoculars deliver outstanding optical performance and stabilization capabilities at a very affordable price. Whether upon the water's edge or high in the catacombs of a stadium, you'll get a close view of action with this well-contoured Canon offering. 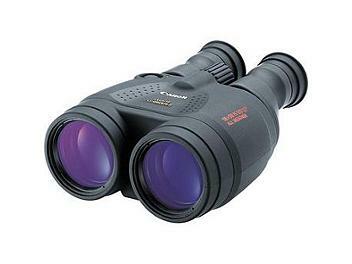 The 18x50 IS binoculars are great for big game hunters, spectators of distant sports such as surfing, or anyone with a hunkering for incredible pulling power which can actually be observed without a tripod. Their water resistant design and tripod threaded hole allow for easy mounting to tripods or monopods for extended periods of observation. This binocular was not designed to be habitually worn around the neck, but if you prefer to carry your optic in this manner then the recommended thick neoprene strap is an improvement over the originally-supplied flat woven strap. The 18x50 IS is threaded to accept 58mm filters, which is convenient for using polarizers around water, but it also means that during extremely bright or humid conditions you can use a pair of 58mm lens hoods to help shield the objective lenses from dew and stray light(and thus improve contrast). The 18x50 IS uses conventional 'penlight' AA batteries to operate its stabilization system, and can use either traditional alkaline, NiMh, or lithium versions. It is highly recommended to use lithium whenever conditions are terribly cold, as it greatly increases the battery life at those times. In conditions below 20oF(-7oC), normal alkaline batteries will provide only a tiny fraction of the operating time that you could expect from lithium power.